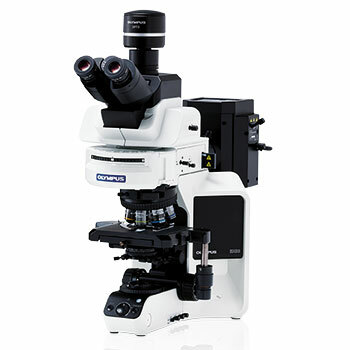 The BX53 provides advanced modularity to suit a variety of observation styles. The rigid, compact space-saving frame features forward-mounted, easy-to-operate controls for improved efficiency and greater operator comfort. New operator controls are accessible from either side of the microscope, and an ECO sensor automatically turns off the transmitted light when the operator is not seated at the microscope. This microscope is now complete with LED. The BX53 Motorized upright microscope can be equipped with any or all of the following motorized accessories: a motorized objective nosepiece, a motorized fluorescence filter cube turret, a motorized transmitted light condenser and a motorized attenuation wheel for fluorescence excitation. A handset or optional software control permits the synchronous operation of the motorised accessories for accurate and easy microscope operation. Highly scalable microscope system to answer the demands of research today and tomorrow. New fluorescence illuminators, filter cubes and Olympus high performance filters provide added convenience to researchers – there’s no need for tools to add a filter cube to the new 8-position illuminator turret. Designed for maximum flexibility, the BX53 features forward-oriented controls for ease of access and improved operator comfort. The 12V/100W halogen illumination source provides bright, balanced illumination for brightfield and contrast observation methods. Ergonomic Y-shaped frame for maximum stability and comfort, with low position focus control knobs located on both the left and right sides of the frame. Olympus UIS2 optics deliver bright, sharp, high-contrast images.